A few years I had the privilege of fishing in the Richtersveld. It was an amazing experience to fish in such pristine waters, but fishing was tough due to a cold front passing by. Ever since that first visit, I have been contemplating a return-trip to experience this area of the Orange River in all its splendor. We have seen a few trophy catches coming out at this venue in the past two months and this was enough to motivate planning a trip to visit these special waters. De Wet Niemann fishing the river often and he invited us to join him for a few days on the river. He offered to show us around and made his three kayaks available for us to use during this trip. I was looking forward to fish from kayak again as I enjoy this type of angling a lot, even though I don’t get to do it as often as I would like to. We set 5 days aside for fishing and 2 days for driving (9 hours drive from Pretoria). Our crew consisted of my dad and I, Koos Bonnema and De Wet. Two of the days we would stay at De Wet’s house, after which we would set up camp next to the river for the last three days. Camping next to the river is very nice in terms of fishing, but one must realise that you will have to survive with no luxuries. 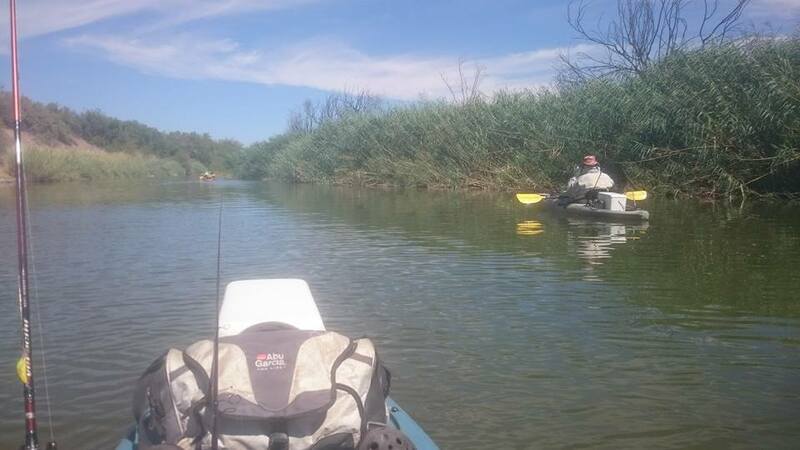 The temperatures are insane at the river during this time of year; we experienced temperatures between 44 to 48 degrees each afternoon – so, it is of utmost importance to take at least 4 liter of water with you on the kayak per day. It was also important to stay covered; long sleeved shirts and trousers, buffs and caps as well as high SPF sunscreen (like Xeroderm Camo) were crucial in order to survive the scorching heat. You should also note that shade is a very rare thing to find next to this river, but at least you can take a swim to cool down when the heat becomes unbearable. Upon arrival at the venue, we settled in at De Wet’s house, followed by a short visit to the river for an afternoon session. According to De Wet, the river is the lowest it has been in many years due to the on-going drought. We noticed this as we arrived at the river to find an area with almost no suitable waters to fish. We saw hundreds of muddies tailing and turning everywhere and decided to make a few casts for some yellowfish. My dad managed to catch one small largemouth yellowfish while the rest of us only managed to foulhook a few mudfish. Both Koos and I lost a few lures between the boulders and it wasn’t long before we called it a day. Interesting enough, the sun only set around 20:00 during December in this area and it rises at 05:00 – 15 hours to fish per day! At 05:30 we were already at our spot and ready to go. The spot we fished consisted of a small rapid with two big pools above and below it. The rapid was relatively shallow, while the pools were nice and deep. We saw some monster catfish turning on the surface in the bottom pool, but decided to kick off the morning trying for yellowfish. 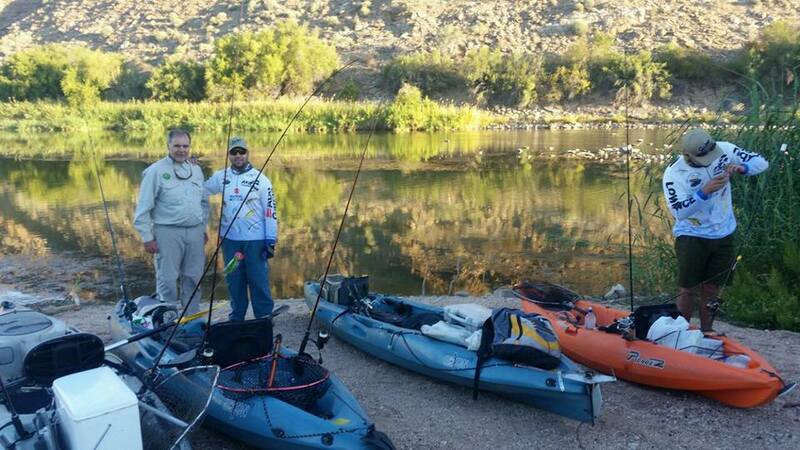 Koos and myself fished on the one side of the rapid while my dad and De Wet fished on the opposite side. I fished the head of the rapid where it meets with the pool above it. The current was flowing downstream from me. I saw a few gullies that formed in the mouth of the rapid which looked like promising spots for yellows to ambush their prey. The trick here is to make accurate long casts into the gullies as you will spook the fish if you move to close to them (water clarity was great so they can spot a person very easily). Once you place the lure in these gullies, quickly reel up your slack and make contact with your lure. Next you just keep in contact with your lure while retrieving it as the same pace as the flow of the river (if you are unsure – the slower you retrieve your lure, the more takes you will get). On my second cast in the gully I went tight; the fish broke the surface on the take and gave a short run. After a few short runs a largemouth yellowfish of about 2.5 kg surfaced next to me. I released the fish without taking a photo of it. A few casts later I caught another two small largies. Koos went tight with a big fish that ran far with his lure before cutting him off on some rocks (he didn’t fish with a leader on his Nanofil for this first session). My dad also hooked a big fish which came off after a long run. 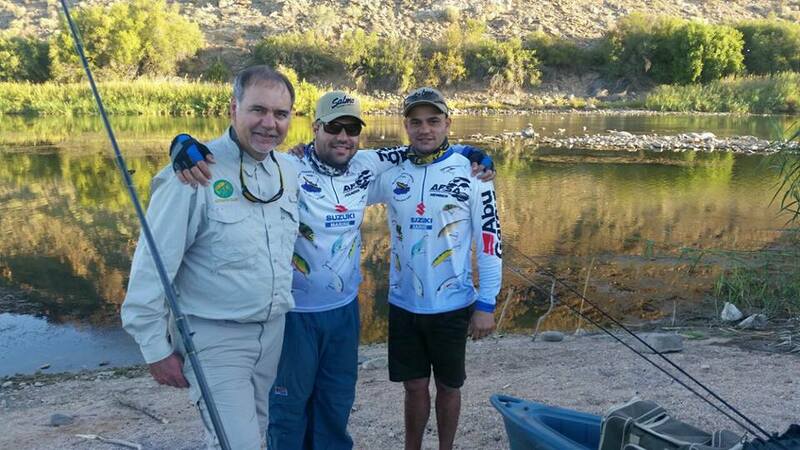 De Wet managed to also hook up with a few small yellowfish. Within a few casts the spot went dead and we decided to move downstream in search of another spot. As we moved downstream into one of the big pools we saw numerous big catfish rise around us. We took out our catfish casting rods and made a few casts on the rising fish to see if any of them were willing to take our lures on the drop. De Wet used a very short and stiff rod for this application with a 4000 spinning reel; in retrospect I think this combo may be a better option for targeting these big catfish from kayaks. Accuracy – You must cast extremely accurately; you need to cast exactly on the spot where the catfish has turned. Every centimetre you are off the spot increases the fish not taking your lure. Timing – You need to cast your lure on the rise as quick as possible; the longer you hesitate to present your lure, the less your odds are of getting a bite. Noise – At some venues the catfish prefer a softer splash when your lure is presented to them after they rise, while at other venues they prefer a loud splash (you need to experiment with this to find out to which one of the two presentations they prefer on day). This technique has produced up to 29 kg catfish for De Wet at this venue and he has a lot of faith in it. Just note that you need a SLOW SINKING pumpkinseed for this technique to work. Also note that catfish don’t always react to this technique (as was the case on this trip).On a final note; rather focus on making quick and accurate casts on fish turning relatively close to you, instead of casting at every fish you see – make every cast count! All four of us made several casts at turning cats with no luck. I did manage to catch a 6 kg job that cruised passed me and Koos managed to catch a few small cats on the popping techniques. After we tried for about two hours with no luck of hooking up with a proper fish, we decided to move on to the new spot and paddled downstream. Must admit that I have never seen so many big (15 kg +) catfish turning in one area – this river has a healthy population of monster catfish. As we paddled on to the next spot we noticed many schools of pan-size blue kurper cruising just below the surface. Some were swimming next to the weed lines while other schools were swimming in the open water. After watching these blue kurper for a while, I noticed that something was smashing them every few minutes. I decided to take out my heavier spinning rig and wait for another smash to cast to. Soon enough a big fish smashed a school close to me and I immediately responded with casting my lure on the spot. As the lure hit the water it was immediately smashed ferociously which led to a massive splash – the sight that every angler dreams about! The fish gave on proper run, but they the line went slack and I realized that I didn’t get a proper hook set. Judging by the size of the splash and the intensity of the run, I’m convinced that this was a 5 kg + largie that took my lure on the drop. I made a few more casts and missed two other bites before going tight with a solid fish. 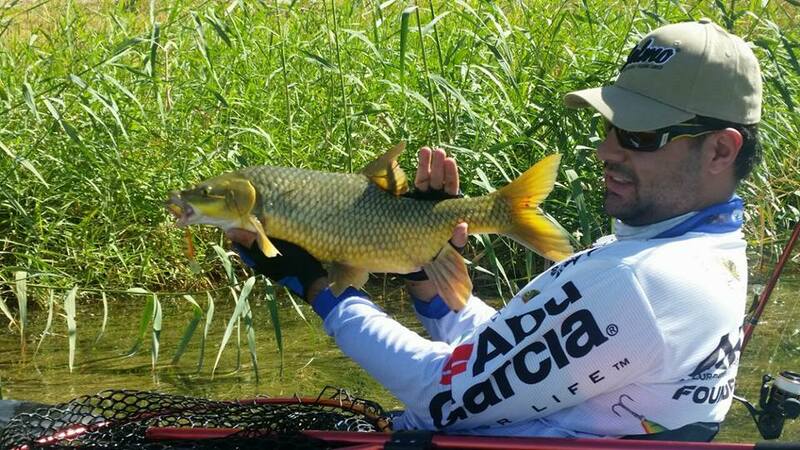 After a few good runs and a lekker fight, I managed to land a solid smallmouth yellowfish. My dad came closer and managed to catch two decent largies in the area on the 7 cm Salmo Minnow SDR (Real Roach colour). For some reason the yellows went off the bite, but we still saw plenty of them rising around us. I could clearly see that most of the fish rising around us were largemouth yellowfish – a cool sight to see! 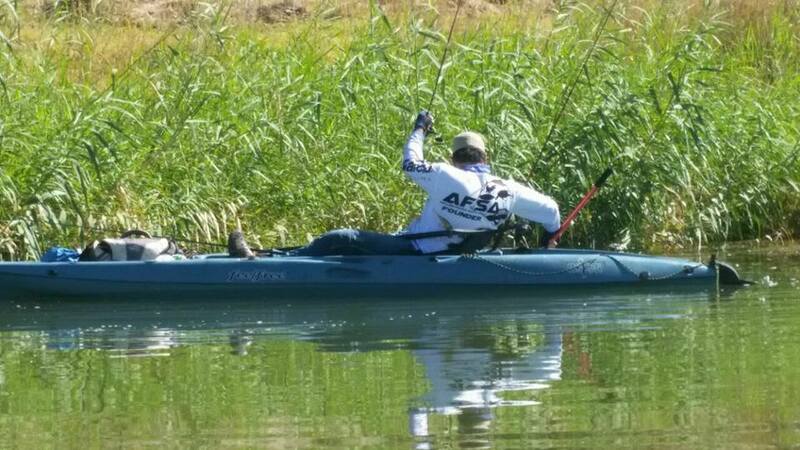 I was also surprised when a big male in blue kurper in full breeding colours followed my lure to the kayak – seems all the species in this river are willing to take cranks! 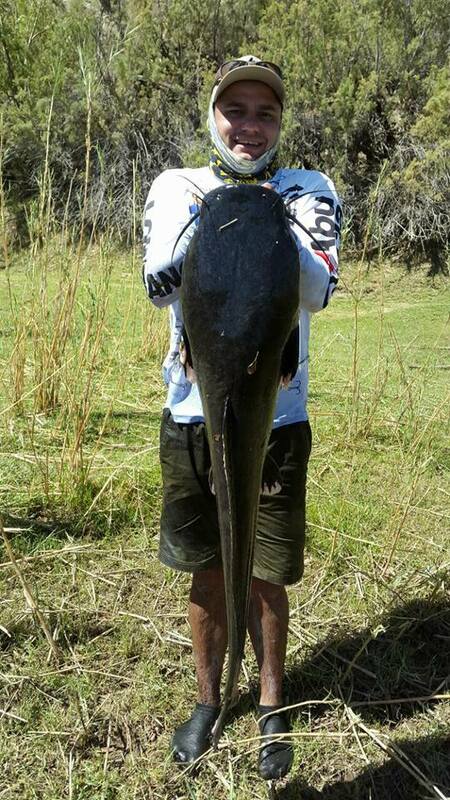 Later that day Koos managed to catch a 12 kg catfish on the popping method and he got schooled by a huge catfish that took him straight in to the weeds and trees. He battled long to pull the beast out of the structure, but to no avail. Eventually the fish snapped his 50 lbs leader line – hectic stuff! All and all, even though we caught a few fish the first day, it was quite a tough day out on the water. Yet, we were still amped to see what the rest of the trip had in store for us.